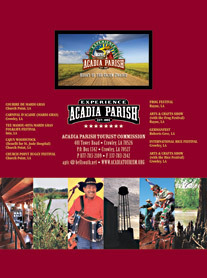 Welcome to Acadia Parish, the center of Cajun country where the French-speaking culture is part of our everyday life. From the heart of prairie country through bayous, swamps, rice fields and more, you’ll find no place like Acadia Parish anywhere else in the south. Friendly folks, lively festivals, world-famous music and Cajun cuisine await you. One of Louisiana’s oldest and larg––est agricultural festivals, the International Rice Festival calls attention to the importance of rice as a food and emphasizes its place in the world’s economy. The festival takes place in historic downtown Crowley and is one of the few festivals still free to the public. Held the third weekend of October, the festival features numerous Cajun and Zydeco bands on two stages, two parades, Queen’s Ball, rice cooking contest, rice eating contest, arts and crafts booths, carnival rides, and numerous food booths featuring great Cajun food. Held the first full weekend in June, the Church Point Buggy Festival offers live Cajun and Zydeco music and dancing, carnival rides, pageants and contests, food booths, arts and crafts from the region, antique buggies on display, Queen’s pageant, and the Grand Buggy Parade. A festival to highlight buggies was chosen as a means for fundraising because Church Point, whose ancestors had used buggies as their main means of transportation into the early 1950s, was known as the Buggy Capital of the world. The Festival was organized and charted in November of 1981.The festival has donated over $440,000 to the Acadia St. Landry Hospital, civic organizations, and to the city of Church Point for park improvements. Starting the Sunday before Mardi Gras since 1961, Church Point’s Courir de Mardi Gras “The Best Traditional Mardi Gras” features, colorful costumed horseback riders, wagons, buggies, live music, children and adult runs and parades. All events start and end at the Saddle Tramp Club House on East Ebey Street. A beautiful two day festival to help find a cure for the kids of St. Jude’s Hospital, Cajun Woodstock is a weekend of food, fun, and the greatest music in the state. Join them the last Saturday and Sunday of April at the City Park Pavilion and help give the children of St. Jude a fighting chance at the life they deserve. the celebrated Tuesday. Party Goers enjoy live entertainment, favorite festival foods, a costume contest and a traditional parade. The Grand Mardi Gras parade is held on Tuesday afternoon which includes bands and floats with plenty of beads! The celebration grows each year with new features. Join our Rice City Revelry! The annual Rayne Frog Festival celebrates the city’s role in promoting this unique Louisiana delicacy. Activities include frog racing and jumping contests, the Lions Club Frog Derby, a queen’s contest, parade, carnival rides and live music. The first official Rayne Frog Festival was held in September 1973 under the sponsorship of the Rayne Chamber of Commerce. The festival is now sponsored by the Rayne Chamber of Commerce and Agriculture. Contact the Rayne Chamber of Commerce for date and times. Nestled in the heart of “Cajun Country,” Roberts Cove is a small German community that celebrates their rich German heritage during their annual Germanfest. This two day festival, held on the first weekend of October, offers live entertainment, authentic German food, a large selection of German beer on tap, folklore demonstrations and children’s activities. The clean and family friendly environment makes the festival a great place to visit! Young or old, the Germanfest will leave you with memories that you will never forget! Join us for a taste of German food, fun and heritage! Prairie Cajun Mardi Gras at its best! See the last of the totally traditional Prairie Cajun Mardi Gras groups singing, dancing, and chanting their 400 year old chant in French, all wearing handmade screen masks, costumes, and capuchons. The “Mardi Gras” arrive about 2:00 p.m., but the festival is an all day event in downtown Iota, where only traditional Cajun foods are served and Cajun crafts are displayed and sold. Live Cajun and Zydeco music all day on an outdoor bandstand and dance floor. Visit the “Children’s Tent” featuring the best young Cajun musicians in the area! Always held on Mardi Gras day (Fat Tuesday). Free Admission. Situated in the heart of Historic Downtown Crowley, sits one of the most unique second-story opera houses still standing. Built in 1901 by David E. Lyons, the Grand was known as the place for entertainment and hospitality. Used mainly for vaudeville and minstrel performances in the earlier days and for silent movies and talkies during the later days, the Grand attracted people traveling through the south, specifically those passing through Crowley via the railroad, which was located just a few blocks from the opera house. For the 39 years it remained open, notables such as Enrico Caruso, Babe Ruth, Clark Gable, Huey Long and Madame de Vilchez-Bizzet of the Paris Opera were just a few of the famous to grace the stage. The Grand Opera House of the South reopened its doors in 2008 and in keeping with its historical authenticity and beauty; the Opera house now serves as a fully functioning, state-of-the art performing arts venue. It also features a museum that holds the treasures of days gone by. Memorabilia including the original sign that hung outside the Opera House, old stage costumes and a collection of show-biz era Opera house relics will take you back to a bygone era. The Southern Amusement Company began construction of the Rice Theatre in 1939. Construction was delayed by the Flood of 1940 and it opened in January of 1941. The Rice Theatre is done in the Art Deco Style, which was a popular international art design movement from 1925 until the 1940s, and is characterized by the use of materials such as aluminum, stainless steel, lacquer and inlaid wood. The city of Crowley purchased the theatre in 1986 and a limited remodeling project was undertaken. In 2001 a complete restoration of this landmark began and today the Historic Rice Theatre is an impressive example of eclectic form of elegant and stylish modernism Art Deco design. These days the Rice Theatre plays host to numerous civic and community events and a wide range of live local, area and national entertainment. Built in 1920 the Crowley Motor Company was the city’s Ford Model T dealership. Designed by an architect for the Ford Motor Company, it was one of 1,000 similar Ford dealerships constructed in the United States with only a few remaining today. In September of 2000, the city of Crowley purchased the building from the J.D. Miller family. Restoration began in August of 2003 and in February of 2006 City Hall moved in. The building is also home to four museums: The Rice Interpretive Center, the History of Crowley, J.D. Miller Music Recording Studio, and Ford Automotive Museum. Le Vieux Presbytere is a one-and-one-half story frame bousillage residence located across from the church square. This is of state significance in the area of architecture as a rare and important example of a method of construction associated with Louisiana’s very significant French Creole architectural tradition. This is one of the last structures in south Louisiana to use folk craft of mud wall construction, which is known as bousillage. In this building technique, frame walls, with French joinery, are in-filled with a combination of clay, Spanish moss, and sometimes animal hair. Once this material is in place within a wall, it dries and hardens to form a solid structure which, in many ways, is analogous to reinforced concrete. Bousillage construction, as it was practiced in Louisiana, should be viewed as the lineal descendent of a medieval European form of construction known as half-timbering. In this case, mud and Spanish moss were substituted for the lime, plaster and straw used in half-timbering. A rice farm since 1890 and tourist attraction since 1965, Crystal Rice Heritage Farm has all the answers for you. It features two unique museums, the Blue Rose and Salmon’s Classic Car Garage, along with an agriculture tour. The Blue Rose Museum is named for Sol Wright, who in 1912 developed a revolutionary variety of rice called the “Blue Rose.” This 1884 Acadian-style cottage, built of Louisiana cypress, handmade brick and bousillage, features antique furniture and valuable heirlooms. Salmon’s Classic Car Garage is home to numerous cars that will take you back to the years when cars were classic and big. Featuring two Mercedes 300 SL Roadsters, 1937 Packard, 1964 Cutlass Oldsmobile 442 are just a few of the classics you will find here.